…all things can be pink if you want them to be! I’ve finally gotten in some stamping time and couldn’t wait to play with my new SU! “Just Buzzin’ By” set…. SO-O-O-O FUN!! The little bee images are just the cutest sweetest things! This is an SUO card. Gift Card and Holder Winner! And the winner of my gift card and holder is…. Post #165 – Barb S.!! “These are cute. I will have to give this a shot. I usually give Gift Cards in “stockings” so now I have a better way to “stuff” them. 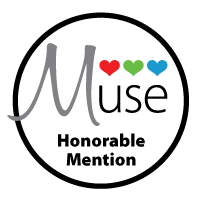 Thanks for a chance to win one of your ideas.” Barb S.
I’m still away from home but am having fun visiting with my sons and their families… no new granddaughter yet. I have seen a lot of these darling onesie cards. I just had to make one for my little granddaughter that is to be born any day now. 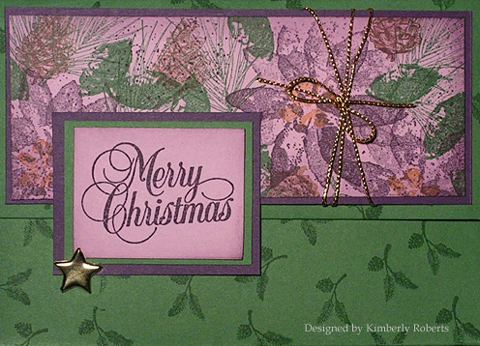 If you want to make one, too, Kay Kalthoff (Speedystamper) has a wonderful tutorial on her blog “Stamping to Share”. Thank you, Kay!! Oh and don’t forget about Sharon’s blog celebration which continues through Friday of this week!! Just a quick post today to remind everyone about Sharon’s blog party “Stamp Simply Celebrates”. And YES there is MORE BLOG CANDY being offered. So be sure to check out all the action!! Oh and btw I will be hosting a challenge and will have BLOG CANDY tomorrow (Sunday). Hope you can come and play and sign up to win a special “gift” that I hope everyone can use this time of year!! AJ Otto – The Willow Garden – AJ has some BLOG CANDY to share! Sharon Johnson – No Time To Stamp? – Sharon has more BLOG CANDY! Heather Telford – bits and pieces – Heather is sharing a Featured Project with us today — how to Dress up Your Table! Fun!!! And Heather is also incorporating a Challenge in with her project, making it 1-2-3 easy for us to decorate our own tables!!! Be sure to stop in at Heather’s place today for many great samplings of table decor! LeAnne Pugliese – Wee Inklings – Doesn’t every Mother need a helper, especially during the Holidays? 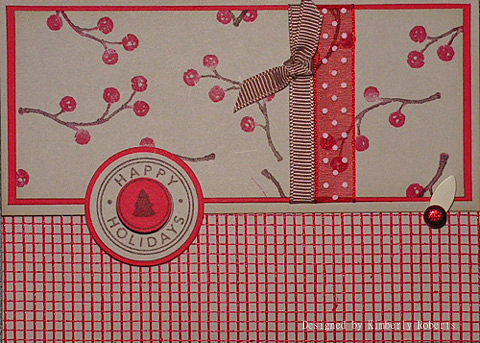 Well, for LeAnne’s Featured Project that is just what she is giving us, a Mother’s Holiday Helper! LeAnne is running a Challenge along with her project, providing us with templates and instruction so we can quickly and easily create our own helper!!! Don’t miss it!!! And Remember: Anyone can play ANY of the challenges by ANY of the hostesses during the 12 days of Stamp Simply Celebrates!!! You DO NOT need to have a Blog to play — uploading your project to SCS (Splitcoaststampers.com) is not only permissible, but HIGHLY ENCOURAGED. When doing so, use the KEYWORD SSC08. Have a great day!! 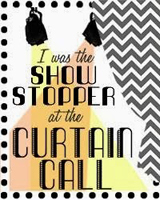 And hope you can stop by tomorrow for my challenge and BLOG CANDY!! 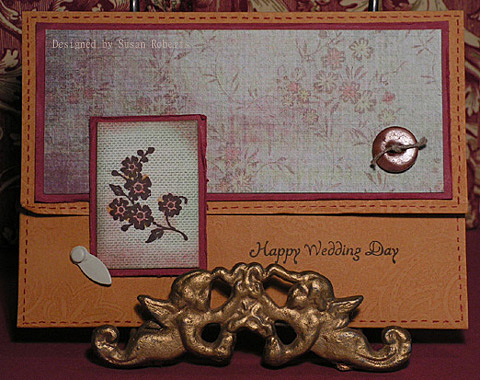 Today’s card fit both challenges in Sharon Johnson’s blog party “Stamp Simply Celebrates” Day 5. I used and old set called Cottage Roses. And even though it is a retired set, it felt close to the same style as the roses in the designer paper. I don’t have the inks in the in-colors, so I used Ruby Red and Old Olive. They were a pretty close match to the Riding Hood Red and Kiwi Kiss. At least they didn’t seem to clash! Barb Schram – Explore. Dream. Discover. – Barb has an offering of BLOG CANDY today!! Sharon Johnson – No Time To Stamp? 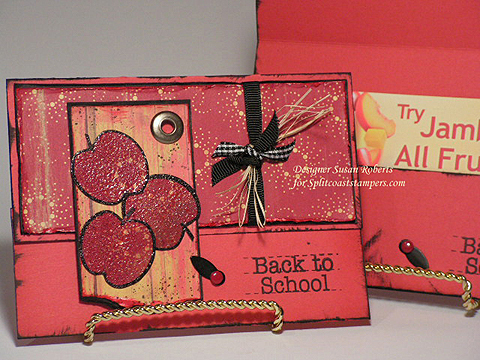 – Today is Sharon’s regular Stamp Simply Challenge. 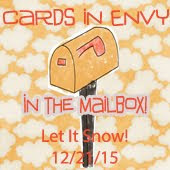 Be sure to check out her fun twist on a Christmas card!! NOTE: Cat’s Challenge and Sharon’s challenge can tie in together well and you can get two challenges done on one card! 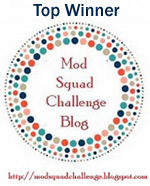 Anyone may participate in these challenges and all the fun events, blogger or not!!! If you upload to your Blog, provide a link to your entry in the appropriate post by the Challenge Hostess. If you upload at Splitcoast, PLEASE KEYWORD all Splitcoast uploads for this event SSC08 (Stamp Simply Celebrates! 2008). If you upload at any other online gallery, just make sure to link to your Challenge Hostess so she can find your entry. Thanks! This is a Stampin’ Up! only (SUO) card. Do you still have Christmas cards to make? 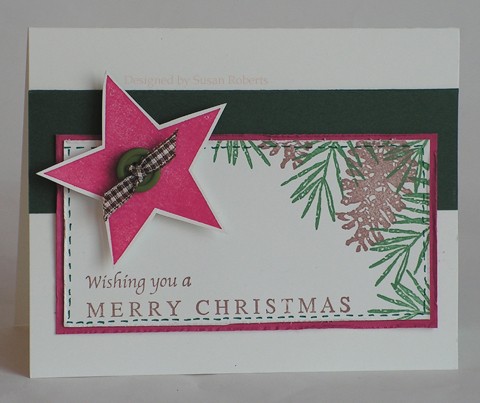 Well here is a group of Christmas cards that would be quick to make and easy to mail. When I saw Tammy Hershberger’s challenge yesterday to mass produce a card (part of Sharon’s “Stamp Simply Celebrates”), I decided to do just that with one of these. Thanks for such a fun (and useful this time of year) challenge, Tammy! 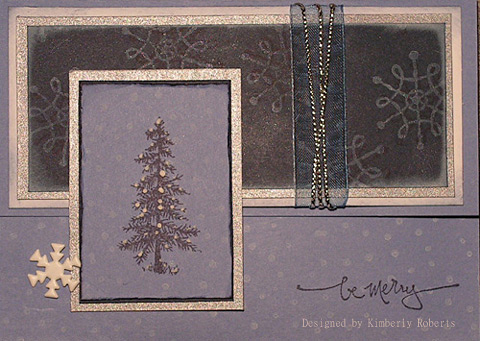 This week’s challenge over on Our Creative Corner is to incorporate snowmen or snowflakes on a card or project. One of the cards in the group fits this challenge perfectly! The ribbon is from the Dollar Spot at Michael’s. Isn’t it cute! This third card of the group is a Stampin’ Up! 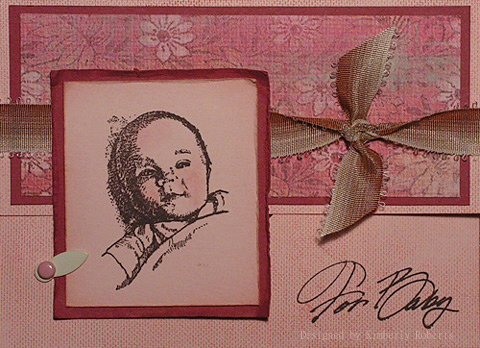 Only (SUO) card meaning that all products used are made by Stampin’ Up!. 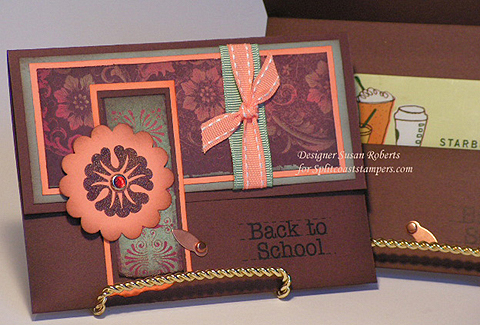 The last two (three) cards also use Stampin’ Up! products with the exception of the sentiments. And finally…if you are still with me here … don’t forget to check out Sharon’s “Stamp Simply Celebrates” today!! 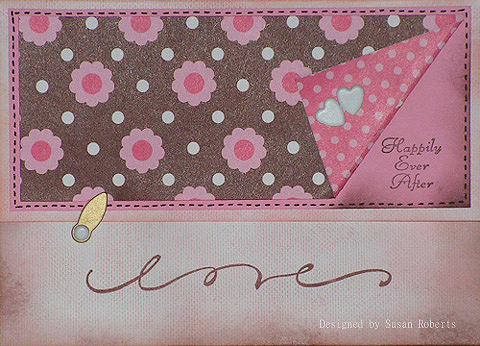 Dee Jackson – Stampin cuz I Luv 2 – Dee has some BLOG CANDY today! Sharon Johnson – No Time To Stamp? – With more BLOG CANDY! Deb Saaranen – Dream In Color – Do you need a quick, but lovely, little gift for someone? Maybe your child’s teacher, an elderly lady from your church or neighborhood? 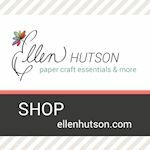 Today Deb’s Featured Project is to make a gift of Note Cards, attractively packaged for gift presentation. She is also turning this project into a Challenge for you to participate in, allowing you to show all of us your creations. Be sure to check it out!!! There are sure to be so many lovely samples to inspire!!! 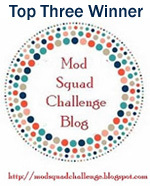 Anyone may participate in these challenges and all the fun events, blogger or not!!! If you upload to your Blog, provide a link to your entry in the appropriate post by the Challenge Hostess. If you upload at Splitcoast, PLEASE KEYWORD all Splitcoast uploads for this event SSC08 (Stamp Simply Celebrates! 2008). If you upload at any other online gallery, just make sure to link to your Challenge Hostess so she can find your entry!!! Have fun!!! 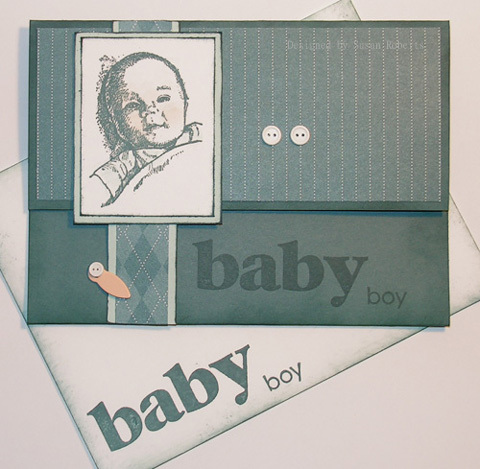 Jennifer Buck – The Buck Stamps Here – Jennifer has some BLOG CANDY today! Joan Fricker – Joan’s Garden – Joan also has some BLOG CANDY today as well! Tammy Hershberger – Stamp Happy – Do you like to get a lot done, and quick? 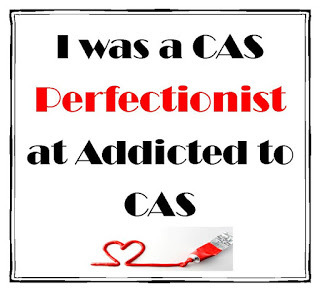 Who doesn’t!!! Tammy’s Featured Project today is a Mass Production Project, but believe me, when Tammy does it, it will not look mass produced!!! 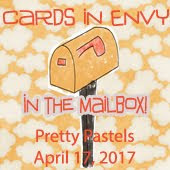 Tammy also offers a Challenge today so you, too, can mass produce some cards quickly!!! Make sure to stop in at Tammy’s today!!! Have a great day!! Hope you can find some time to play! Becky Oehlers – Hemidemisemiquaver Design – Today Becky offers us a beautiful Featured Project showing us some of her over-the-top Gift Packaging Ideas. She also has some BLOG CANDY to share. Be sure to check it all out over at Becky’s place today! You will surely be inspired!!! Sharon Johnson – No Time To Stamp? 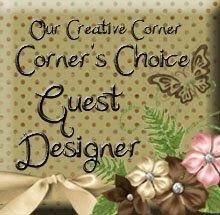 – Sharon has a wonderful offering of BLOG CANDY today — be sure to stop in and see if you can Scor-It!!! 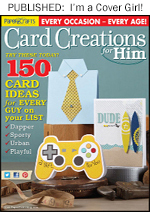 Darlene Pavlick – Dar’s Crafty Creations – Darlene is hosting a fun Challenge today! If saving postage is of interest to you — be sure to check it all out over at Dar’s today. 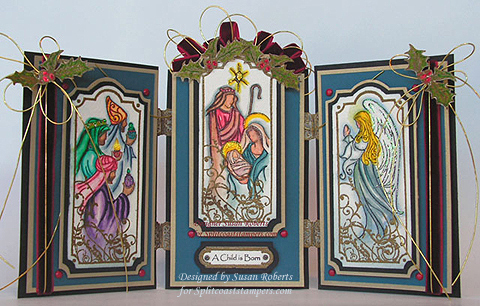 In addition to Dar’s Featured Project of a Post Card, you’ll be able to see all the wonderful samples her designers made as well as all the entries to her challenge that will be popping up over the next many days – so many sources of inspiration!!! Okay I confess… I tried to do a postcard. I really wanted to play along in Darlene’s challenge. But the no layers and no embellishments rule got the best of me. I just couldn’t do it! lol But at least I did end up with another Christmas card. 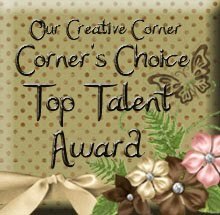 Edited: There have been a few that have asked me how I did the glittered corner/border. I should have included that in the original post… It was late and I forgot to mention that that is all part of the Imaginations designer paper. Using a black Copic multiliner and a glitter pen I did add the straight line across the top and along the right side to make a box around the deer and sentiment. Have a happy day, and don’t forget to check out all the goings on with Sharon’s celebration.